Our Horses are our four legged therapists, carefully selected for their calm temperament and soundness. The legs of these beautiful animals become the legs of our Riders, allowing them a sense of freedom they seldom experience elsewhere in life. Horse riding is a unique form of exercise and rehabilitation. The complex movement of the Horse helps to improve coordination, balance, muscular development and fitness. Horse riding and Horse related activities assist greatly and often dramatically in the development and restoration of personal confidence, self esteem, communication skills, leadership and trust. For people with challenging behaviour for example, Horses offer a powerful medium for restoring a sense of personal control, which significantly improves behaviour towards family, teachers and friends. Our ponies are very important members of our team and we give them the best care we possibly can. We have a very capable Horse manager and their assistants, who ensure the ponies want for as little as possible. 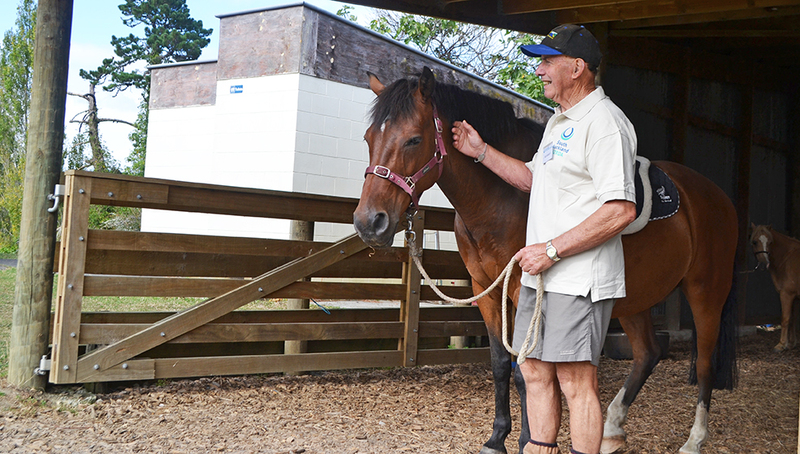 There is a roster of great Volunteers who visit the ponies daily, no matter what the weather. They check on them, as well as feed and medicate them as required. The ponies also get regular Vet, Dentist and Farrier visits to keep them in good health, along with supplements added to their feed. We are always grateful for any donations of hay and equipment for the ponies’ care. Interesting in Sponsoring one of our Horses?